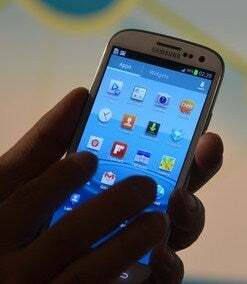 Samsung announced last night that its much-anticipated smartphone, the Galaxy S III, is headed to five U.S. carriers later this month. This morning, two of those carriers confirmed availability and pricing of the Galaxy S III. The Galaxy S III is coming to Sprint on Thursday, June 21 at Sprint stores and online. You’ll be able to choose from two colors -- Pebble Blue and Marble White -- and two memory capacities. The 16GB version will cost $200 while the 32GB version will cost $250, both with a new two-year contract. You’ll only be able to purchase the 32GB version online, however. The S III will be compatible with Sprint’s soon-to-be-turned-on 4G LTE network. T-Mobile will sell the S III in retail stores and online at T-Mobile.com and it too will be available on June 21. The phone will hook into the carrier’s HSPA+ 42 network. Pricing has not yet been announced for the T-Mobile version of the S III nor are there any specifics on colors or capacities of the models. Update: U.S. Cellular also confirmed that the Galaxy S III will be available for pre-order June 12 and will be in stores and online sometime in July. Like Sprint, U.S. Cellular customer can choose from a 16GB or 32GB model in the Marble White or Pebble Blue colors. Pricing has not yet been announced, but it will probably be in line with Sprint's pricing. The super-thin Galaxy S III has a 4.8-inch display and an 8-megapixel camera, and is powered by a dual-core Qualcomm S4 chip. Running Android 4.0, it has new features like a content-sharing service, a voice-activated virtual assistant, and motion controls. It can also tracks your eyes via the front-facing camera to keep the phone on while you’re using it. We got our hands on the global version of the phone last month -- check out our first impressions here. We’re expecting review units later this month, so stay tuned for a full-rated review and other coverage of the Samsung Galaxy S III.